Earlier this summer (yes, it is still summer here in Florida no matter what the calendar says), the good folks at Viking sent me a review copy of David Byrne’s eagerly-awaited Bicycle Diaries (New York: Penguin Group, 2009). 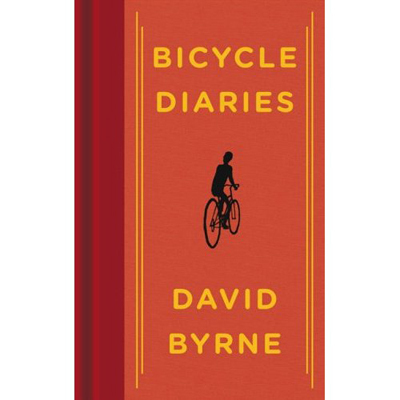 David Byrne first began riding a bicycle for transportation in the early 1980s. Toward the latter part of that decade, he starting bringing a bicycle with him on tour and keeping a travel and tour diary. Bicycle Diaries is an interesting look back at some of his adventures…part travelogue, part social/political commentary and part observations of what is right (and wrong) with the world around us. …[feel] more connected to the life on the streets than I would have inside a car or in some form of public transport: I could stop whenever I wanted to; it was often (very often) faster than a car or taxi for getting from point A to point B; and I didn’t have to follow any set route. The same exhilaration, as the air and street life whizzed by, happened again in each town. It was, for me, addictive. The book is loosely arranged by country…a few stops in U.S. cities, some in Europe, the Middle East and South America. Byrne writes a rambling narrative…his mind is all over the map, both geographically and intellectually. His commentaries throughout touch on art and artists, music, urban and transportation planning, city history and many other subjects. Although it tends to ramble, the book flows nicely from city to city, from country to country, and from idea to idea. There is a lot to absorb here and a lot of references to other works that will make the curious want to read up on some of the subjects Byrne talks about. his role in the bike rack contest held there last year. Finally, he includes a couple pages of brief cycling tips and drawings of some of the bike rack designs he submitted. I enjoyed this book immensely — while I don’t agree with all of Byrne’s advocacy stances, the book was a fascinating journey into his travels, his thoughts and his beliefs about societies throughout the world. Add it to your booklist!